Looking for a good and friendly San Miguel restaurant? 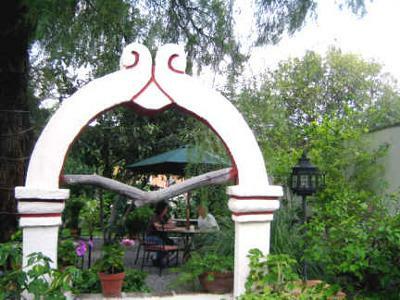 You will be charmed by the lovely garden atmosphere of Café San Antonio, located at Refugio Sur #24, Col. San Antonio. But it's the food that really makes this place stand out as special. The Café San Antonio menu features a variety of homemade dishes including blintzes and pastas. The chicken vegetable soup is reminiscent of something from Grandma's kitchen and practically a meal in itself. Although one of the owners is Ukrainian, you'd think you were dining in Southern Italy while feasting on their pasta dishes. I especially enjoyed the linguini with chicken and mushrooms. Difficult to eat dessert after such a sumptuous meal, but I had to try the flan, it being my favorite. I've had it all over the world and especially every part of Spain. You might call me a flan epicurean. Café San Antonio's flan was definitely up to the challenge. Rich and creamy with a touch of orange. I quizzed the chef on the ingredients. I thought one must be Cointreau. He assured me that liquor was not an ingredient but would not divulge the recipe. Regardless of whatever the unknown ingredient was, it made the end result fabulous. The final tab on our sumptuous fare was very reasonable while the warmth and graciousness of the owners added to an already enjoyable experience at Café San Antonio. best term paper writing services appreciate your cafe! This is the best in San Antonjio for sure! Beyond question, the finest eating background in Puerto Vallarta is supper at Cocina de Autor, upstairs at Cafe des Artistes. This is Thierry Blouet's top notch. It has been picked as one of the world's best eateries, and it is. It may cost all the more, yet in the event that you like sustenance, this is the spot to go. Dissertation House .Obviously, Carmen Porras' eatery, El Arrayan, is the most brilliant sustenance for tasting the customs of Mexico. Her absolute entirety radiate through each dish. Charge Carballo has two of the best, Barcelona Tapas, with a flawless perspective and grand dishes to share, and Agave Grill, with some Nuevo Mexicana tossed in, alongside the best of warm Mexican cordiality and a tequila shop, for tasting and purchasing. Instruction is extremely important to stay cheerful in his life. Since if everybody will instruct then they can better comprehend their money or other issue. Be that as it may, an uneducated individual can't stay content in his life. Our uk custom essays is very good for every student. Cafe San Antonio is a gem! The highlight of our return to SMA each year is an immediate visit to the incomparable Cafe San Antonio. Just thinking about those blintzes makes me swoon. After a month of continuous blizzards here in the Northeast, we are counting the days until we will soon be sitting in the warmth of that courtyard on Refugio Sur.